" The history of Gwaii Haanas provides a model of a respectful relationship between human beings and the earth, a place where people can now learn about a way of life where humans are a part of nature, and where they can experience Haida culture and respect sacred and spiritual values. Sensitive cultural features are fragile evidence of thousands of years of habitation. Traditional activities continue to take place here as part of the living and evolving culture of the Haida. Research has provided an inventory of over 500 major Haida archaeological features. Haida oral history, language, stories and songs have been recorded, and Haida place-names mapped. Evidence of previous industrial uses of the area is also to be found: abandoned mining sites at Anna Inlet, Ikeda Cove and Jedway; the site of a former whaling station at Rose Harbour; and remnants of old trails, logging roads, tramways and shipwrecks throughout the area. 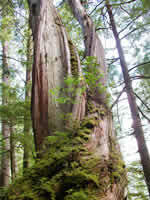 Hundreds of generations of human beings have been nourished by Haida Gwaii. The islands provide an abundance of all the essential ingredients for sustenance and growth. Readily accessible foods allowed time for the development of a complex society and a unique art form that reflects the Haida People's close interaction with the land and seas. Heraldic columns of cedar announce the crests and lineages of the Haida families. Haida house construction has secured its place in the world of architecture. Among the hundreds of Haida sites are the remains of SGang Gwaay which, with the agreement of the Haida, was declared a World Heritage Site by UNESCO in 1981. The village site of SGang Gwaay 'llnagaay on this island is considered to have the world's finest examples of Haida mortuary poles - all more than a hundred years old. The undisturbed areas of Haida Gwaii continue to inspire Haida artists who command international recognition in today's world. Visits to the basecamps staffed by the Haida Gwaii Watchmen at key cultural locations in Gwaii Haanas provide a face-to-face encounter with the living Haida culture. For most visitors, it is the spiritual aspect of these sites which echoes within them long after they've gone home. Haida Gwaii Watchmen basecamps are located at SGaang Gwaay (Anthony Island), Gandll K'in Gwaayaay (Hotspring Island), T'anuu 'llnagaayu (Tanu) and Hlk'yaah GaawGa (Windy Bay) and at K'uuna 'llnagaay (Skedans) just to the north of the park boundary."